The MIT Sloan full-time MBA follows a traditional two-year, fall and spring semester schedule. At the midpoint of each semester, students take a week-long break from their courses and engage in an intensive experiential learning opportunity called Sloan Innovation Period (SIP). SIP activities include lectures from faculty, students and guests that discuss a broader range of topics than typically covered during the semester. Students engaged in Action Learning courses, which integrate classroom theory into real-world experiences, often use the SIP break to travel to visit host companies. Additionally, over winter break Sloan hosts an Independent Activities Period (IAP), a four-week program that allows students to take courses or travel abroad to complete the more in-depth component of Action Learning engagements like Sloan’s G-Lab and L-Lab programs. MIT Sloan full-time MBA students take five required core courses: Economic Analysis for Business Decisions; Data, Models and Decisions; Communication for Leaders; Organizational Processes; and Financial Accounting. This required core curriculum is all squeezed into the first semester, freeing up three full semesters for students to take electives and giving them a significant degree of academic flexibility. Students must complete a minimum of 144 elective credits to graduate, with each elective course representing between three and twelve credit units. MIT Sloan gives its full-time students the option of pursuing one of three MBA Tracks, in Enterprise Management, Entrepreneurship & Innovation, or Finance. Students must complete a set number of required and elective courses to receive Track certifications. Additionally, students can earn a Certificates in Sustainability, Healthcare, or Business Analytics. The MIT Sloan full-time MBA program has more than 400 enrolled in the most recently enrolled class, 42 percent of whom are women. Roughly 38 percent of students in the class are international. For the full-time Class of 2020, the average GMAT score was 728, with the middle 80 percent of students scoring between 700 and 760. Students in the class have accrued an average of 4.9 years of work experience prior to matriculating. Approximately 97 percent of the most recent graduating class received offers within three months of graduation. The mean base-starting salary for this class was $125,000. Approximately 32.1 percent of this class entered careers in consulting, 13.7 percent entered careers in finance and 26.2 percent entered careers in software/internet. Tuition for the MIT Sloan full-time MBA program for the 2018-19 school year is $74,200. Additionally, for 2018-2019, the school anticipated that students paid roughly $2,550 for books and supplies, $2,000 for a computer, $5,300 for food, $6,508 for personal expenses including medical insurance, $15,750 for housing, and $2,750 for various transportation costs. With academic fees, this brings the total annual cost of the full-time program to $111,570. Sloan offers a number of need and merit-based fellowships and scholarships. These include the Class of 2004 Diversity Fellowship for students from backgrounds that are underrepresented at Sloan, and the Forte Fellowship for outstanding female candidates. Additional awards include the MIT China Scholarship Council Fellowship (CSC) for citizens of the People’s Republic of China and the MIT Public Service Center and Social Impact Fellowships for students working to address societal problems, among many others. Finally, Sloan offers teaching and research assistantships to help students cover the cost of tuition. These positions vary in terms of the workload required and stipend. 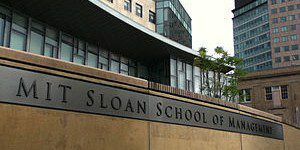 U.S. Citizens or Permanent Residents who are full-time students at Sloan who are eligible for Federal Perkins Loans, Federal Direct Stafford Unsubsidized Loans and Federal Direct PLUS Loans, as well as various private loans. International students must fill out MIT’s Graduate Loan Application in order to determine their eligibility for private loans. Applicants are not required to have prior work experience to apply, although Sloan notes that students with work experience typically get more out of the program. Applicants to MIT Sloan’s full-time MBA program are required to submit an online application, a resume, two essays, two letters of recommendation, academic transcripts, GMAT/GRE test scores and a $250 application fee. The school does not require applicants whose native language is not English to submit TOEFL or IELTS scores to demonstrate English language competency. All applications must be admitted by 3 p.m. EST by the final day of the respective deadlines.